Manhasset 30 1/4" High Stone and Blue Outdoor Wall Fountain | Fountain City Art Ctr. - 30 1/4" high x 19 1/4" wide x 11 3/4" deep. Weighs 20 lbs. 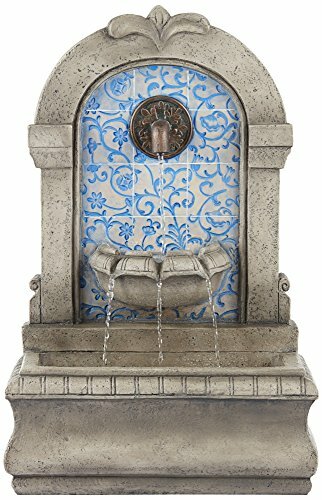 - Free-standing plug-in wall fountain for a garden or patio. Water flows from top spigot into two lower basins. - Stone finish with blue tile pattern. From the John Timberland brand. - Fashioned from lightweight cast resin. Easy to move and position. - Includes a water pump and 6-foot long cord. 4 to 5 gallon water capacity. 30 1/4" high x 19 1/4" wide x 11 3/4" deep. Weighs 20 lbs. Free-standing plug-in wall fountain for a garden or patio. Water flows from top spigot into two lower basins. Stone finish with blue tile pattern. From the John Timberland brand. Fashioned from lightweight cast resin. Easy to move and position. Includes a water pump and 6-foot long cord. 4 to 5 gallon water capacity.